While the new record isn’t Guinness official yet (a Guinness World Records spokesperson said they can’t verify the record until they receive proper documentation), the TVFF organizers are saying it’s the heaviest load ever carried, equivalent to that of a large horse. 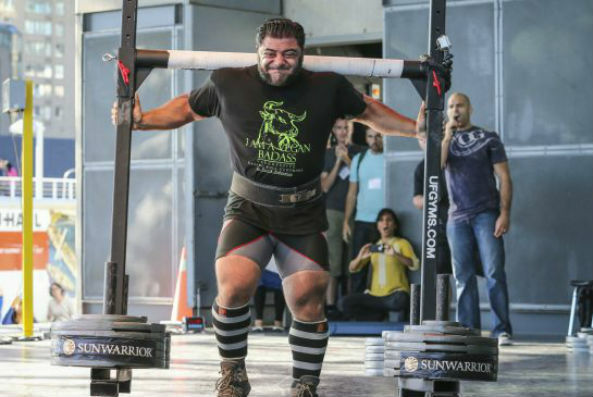 Baboumian started lifting weights when he was a young boy. He went vegetarian in 2006, then after being named Germany’s strongest man in 2011, went vegan. “I just realized that if it’s really compassion that drives you, maybe it’s not enough just to stop eating animals but you maybe should boycott the whole animal industry, because … it’s not what you as a compassionate being would want. So actually you should go one step further and become vegan,” he says. So awesome! I was there and it was amazing! Are you still officially vegan if you’re on steroids?